I like him... he always plays a goofy but likeable character and manages to make me smile whenever I see him... and it's very hard to miss him if he's in a drama. He doesn't get much credit in most shows for how adorable he looks. Seen him in few dramas as well.... not a bad actor but his role in Bambino is really amazing... And his role as a loyal friend of Takumi in Rondo is fabulous. 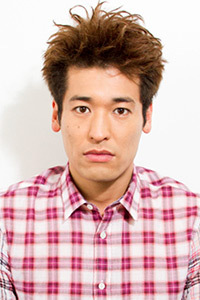 He did a good job in Mamiya Kyoudai along with Sawajiri Erika. He's one of my favorite actors. He's done a great job in every drama I've seen him in. I'm always excited to hear when another drama with him is coming out. This poor guy went unnoticed in Kimi wa Petto. In Pride he was great comic relief, and played a crybaby wannabe. I'd love to see him take more serious roles. Amazingly charismatic in Rookies as the idealist sensei who is always talking about dreams... He seems naive but he's got a lot of heart. I loved him in IWGP ... he's sweet in Gals Circle too. Why'snt he credited for IWGP here??? He acted so well in Bambino!!!! So cool n so cute at times!!! Yeah, he's a very nice and sweet guy in Pride right! He is funny a lot!